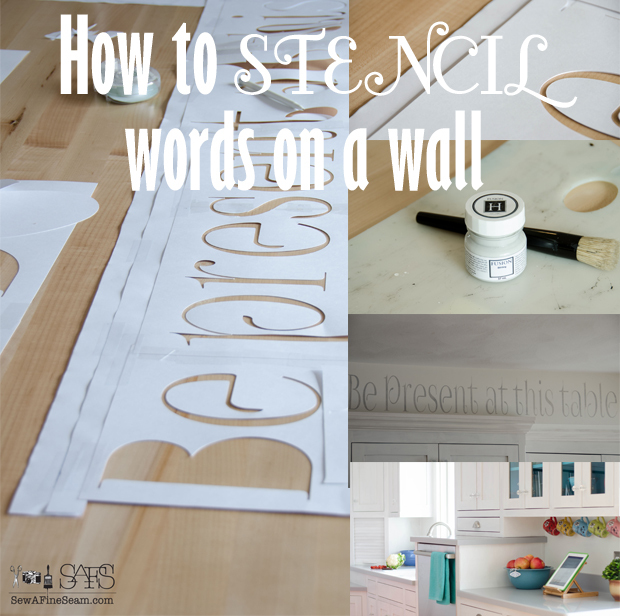 Stenciling on a wall isn’t hard – it just takes some time and patience. 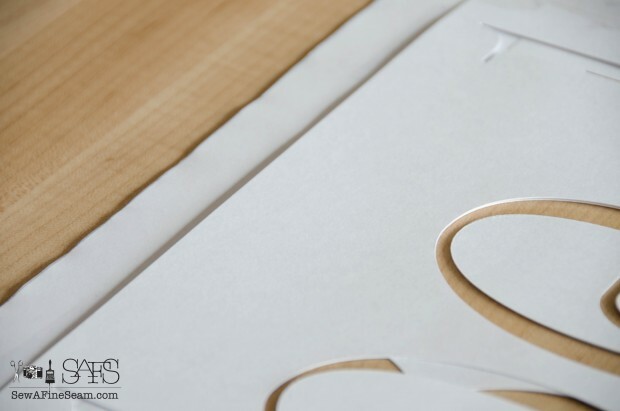 If you use a roll of paper or stencil film it would be easier as you could cut your stencil all in one long piece. 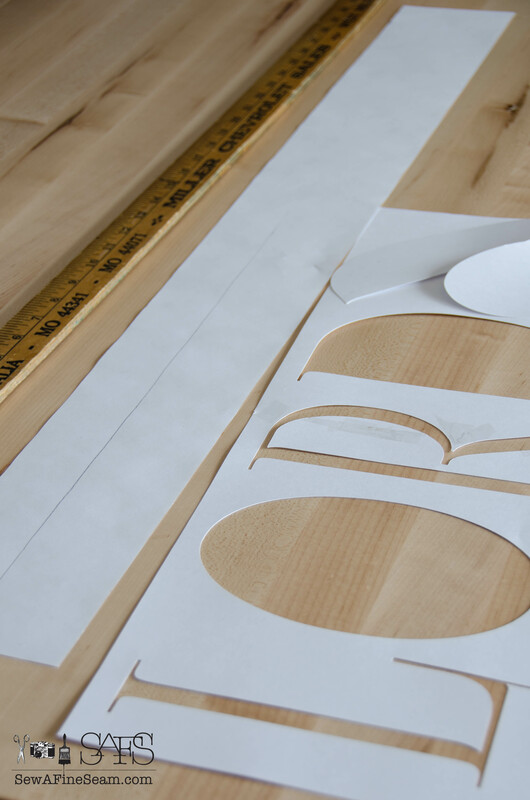 But I don’t have a roll of paper or film this long, and honestly, I haven’t been able to make my (affiliate link) silhouette work right with a roll and no cutting mat. It’s supposed to but I can’t get it to pull properly without the cutting mat. Also the rolls of (affiliate link) stencil film I sometimes use cost enough I don’t use them for a project this big or that I will use only once. 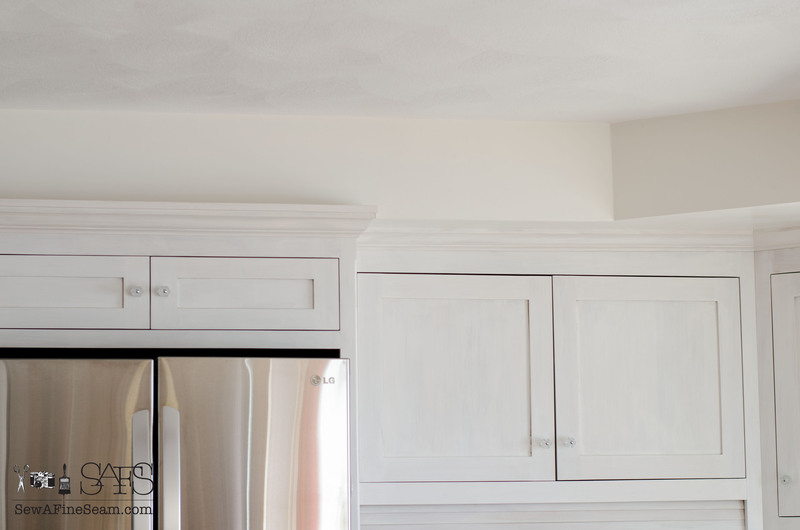 My Mom recently had a new kitchen installed – you are getting a bit of a preview of it here! Those custom-made cabinets were painted by me – with milk paint, in the cabinet shop before installation. I’ll be bringing the full reveal and story of that soon. 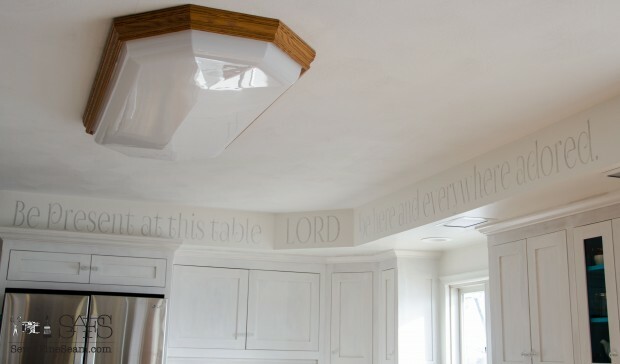 I’m hoping to get a new light hung in my Mom’s kitchen before the reveal but I may have to go ahead without that – there are some issues surrounding it that may make it take a while. You may remember this post about the stencil I did in Mom’s entry. 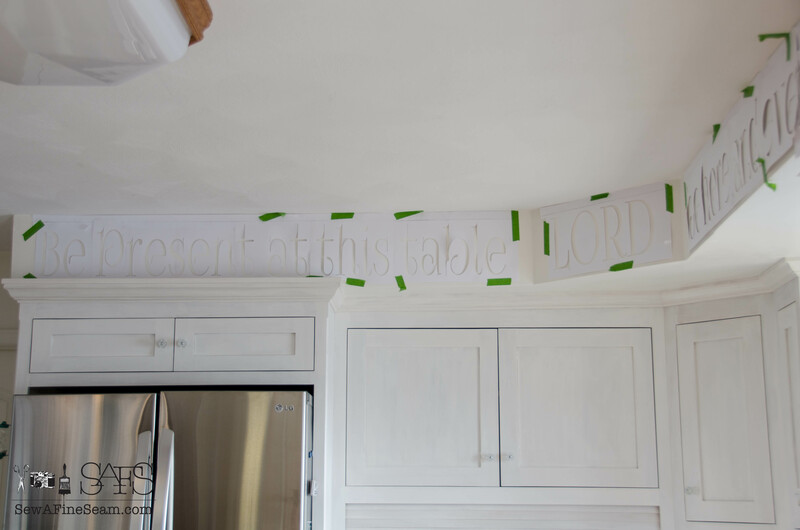 Mom wanted a prayer stenciled on the soffit in her kitchen, so I used my silhouette and card stock to create a stencil to fit the area. 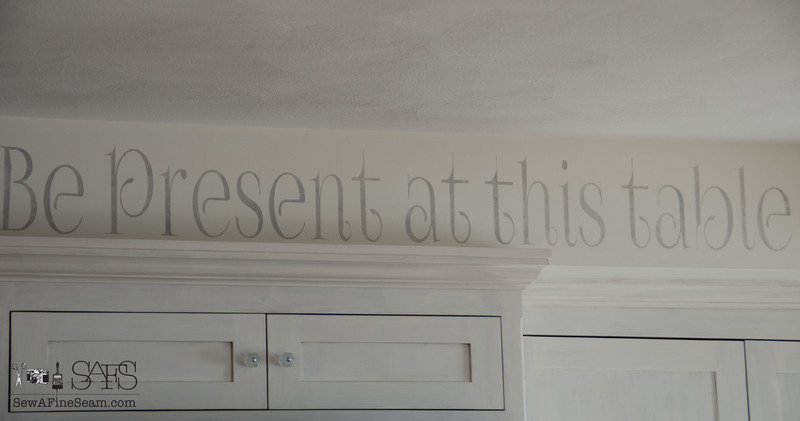 I measured the soffit area where each word would be and then sized it to fit in the software for my silhouette. I then cut what I could fit on two pieces of cardstock that I placed on my 24″ long cutting mat and taped it all together. 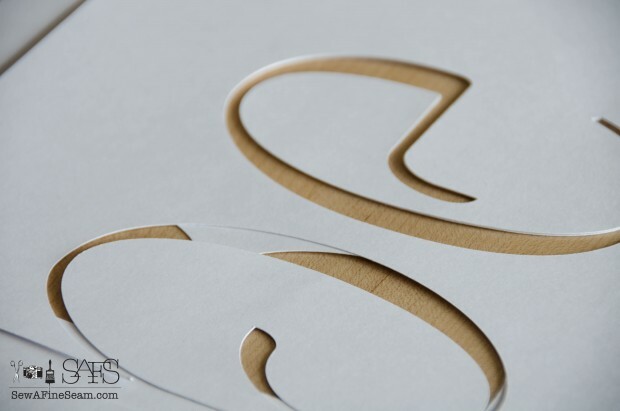 Yes it took awhile, but it was a cheap way to do a stencil that would only be used once. I used a stencil font I downloaded from a free font site called FoglihtenNo07. 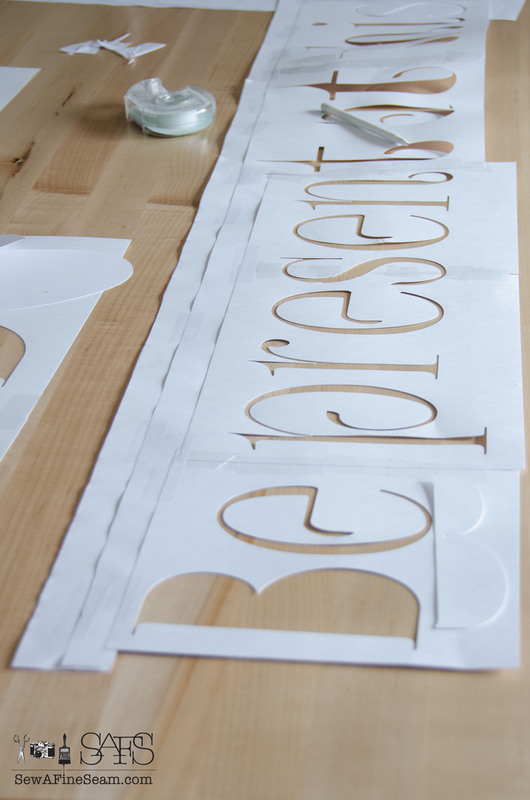 It’s a stencil-ish font so most of the letters do not have center pieces that need taped in to make the letter. Just a few needed it, including the ‘O’ and the ‘D’ in LORD. To make the stencil easy to put on the soffit I figured how far down from the ceiling the letters needed to be and added a strip of paper that had a straight edge at the top that could be butted right up against the ceiling. Since my stencil was cut out of cardstock I had a lot of pieces and they weren’t all cut at exactly the same place on the pieces of cardstock. To make sure I was keeping the words on a straight line I overlapped letters that were the same to strike my line on the added pieces of paper so I would know exactly where the next piece needed to be placed. I don’t know if that even makes sense – it’s really hard to describe now that I’m all done and only have photos – if you try to do this and have questions I’ll be glad to try to explain it better for you via email or even a phone call if need be. 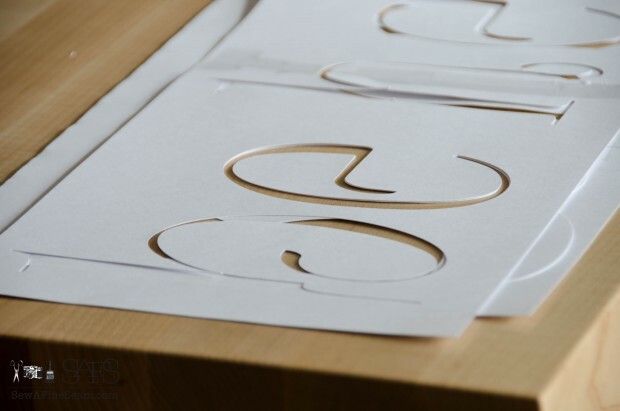 The paper strips I used were from a 24×36 piece of plotter paper my Dad had. 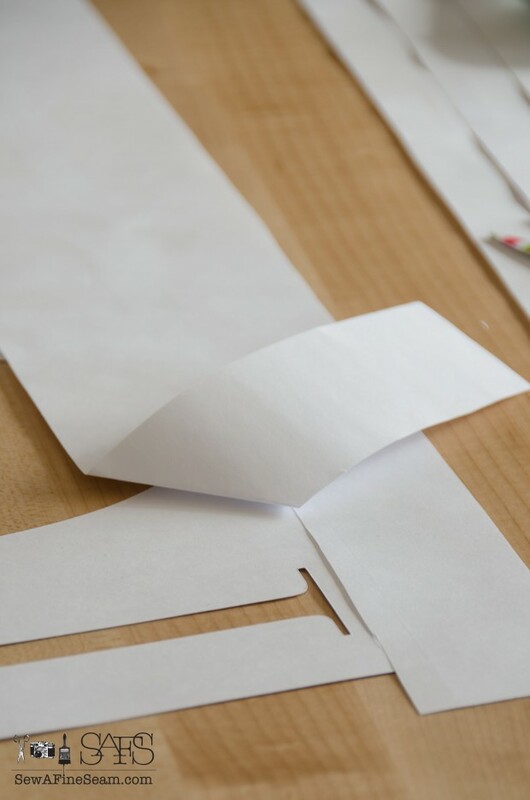 I used a yard stick to draw straight lines, dividing the paper into 6 pieces, each 4 inches wide. 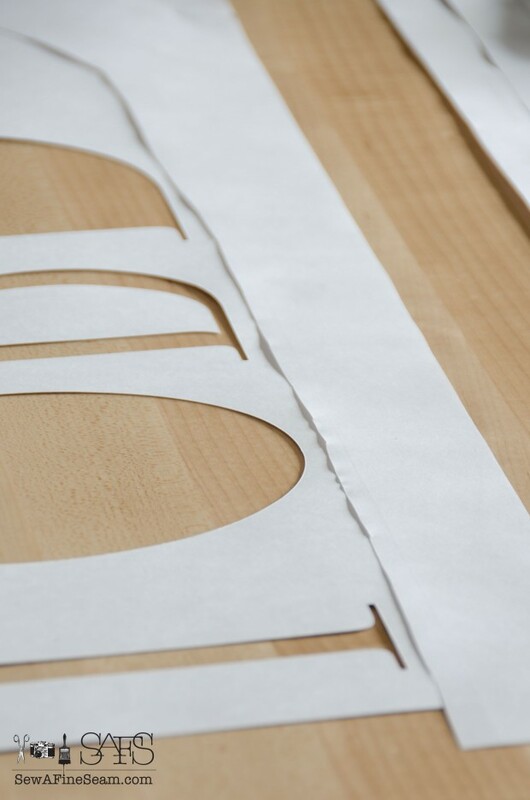 After taping the stencil on the strips of paper were covering part of the stencil from the back. I flipped the stencil over and cut the paper off so the letters showed again. And taped it to the soffit with (affiliate link) frog tape. I used the frog tape rolled into circles to make it sticky on both sides to attach the pieces that were separate centers and also to keep some of the others from flopping forward. Like the h’s and the b’s. 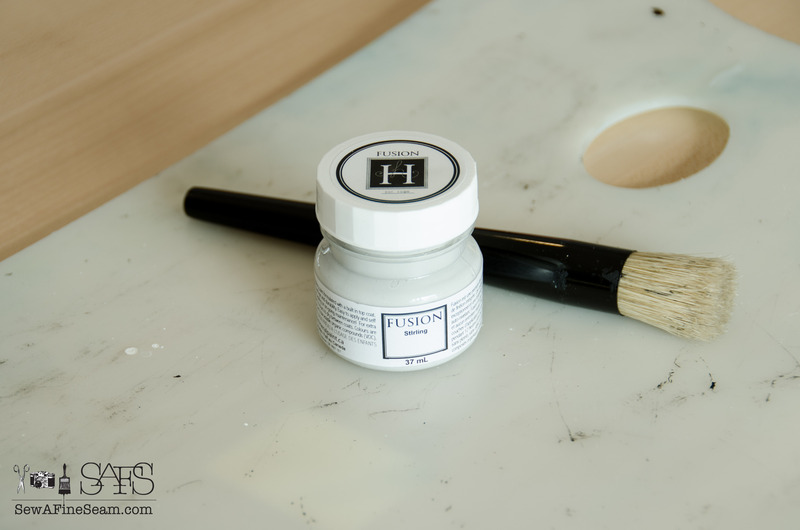 We tested a few colors of paint and decided to go with a light grey. 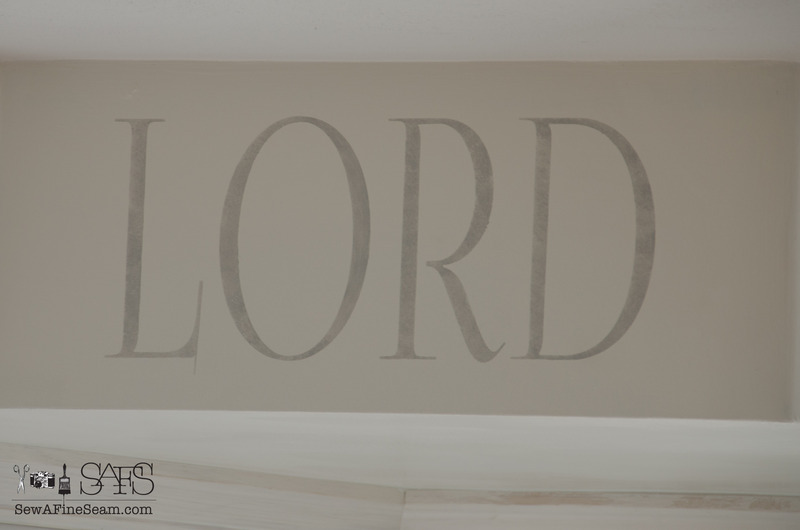 We had intended to paint the word ‘LORD’ in a blue to match the inside of the one cupboard she had painted blue, but once the other two sections were done we loved the subtle elegance of it so much we kept it all one color. My stencil brush is from Royal Design Studio and I love it! LOVE THEM! I bought a set of different sizes and let me just say that I should have done this a long, long time ago! You can find the set I bought here. 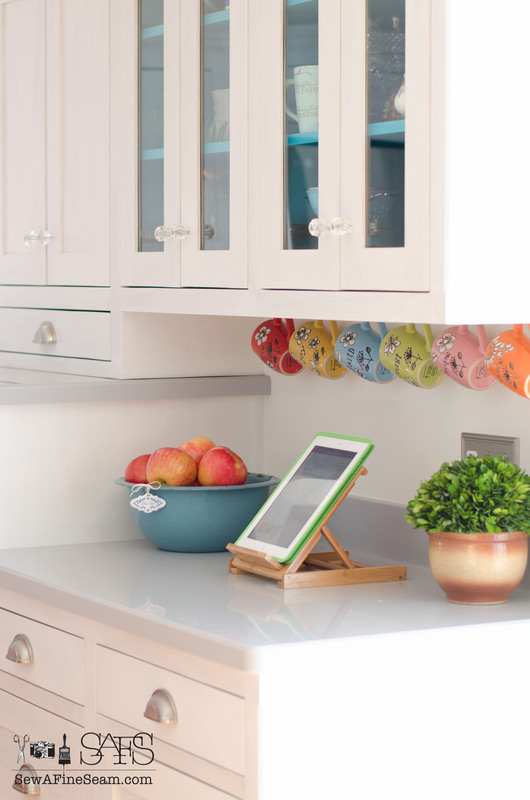 And because it was lovely, sunny day I couldn’t help but do a photo shoot of part of the kitchen. It’s so absolutely gorgeous! And isn’t that raised dishwasher an ingenious idea? It’s so cool having it up where you can reach everything without bending over! 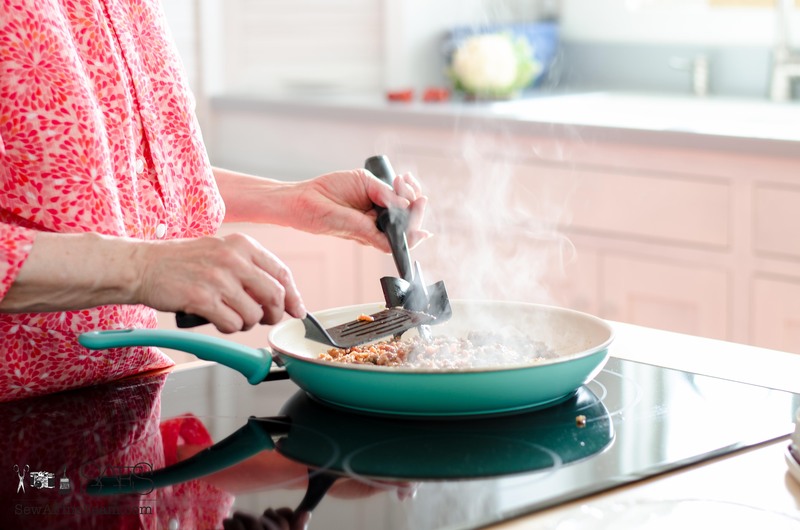 Mom had her (affiliate link) cooktop installed in her island – and just wait till I show you the island in the full reveal – it’s amazing. And that’s it for now. I promise not to wait too long for a full reveal – I can’t wait to show it all and talk about how I painted those cabinets. First of all, I have to say that your brother gave me the iPad holder! I thought as I was typing about the iPad holder that it might have been my brother not my sister! 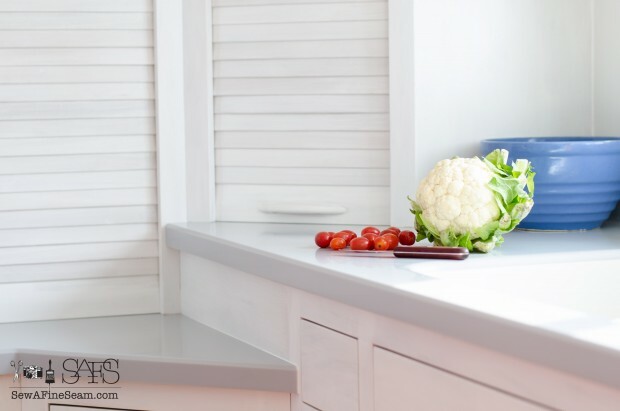 Wow, the preview of the kitchen looks amazing! 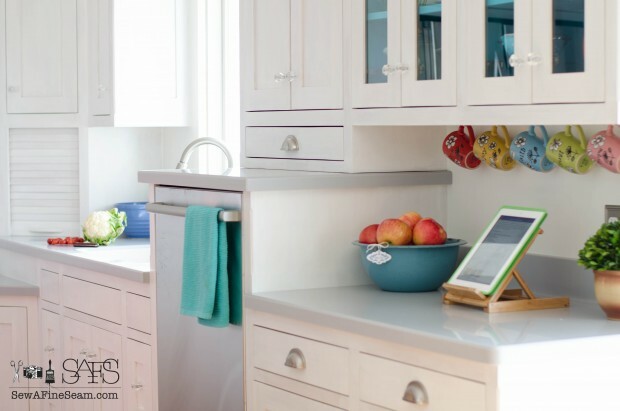 Please be certain to share all of the details (including the type of countertop, how the dishwasher is supported, and the name of the cabinet shop). I really need a new (small) vanity for my bathroom. I just purchased a new dishwasher, but I always wish it was higher since I am a tall gal. Thanks Kellie! I’ll make sure to get all the details! I don’t know how you do it all!!! You are indeed blessed. Thank you Donna – I just do what I love to do! I love the stencil and I love the verse she chose. The photos are beautiful, too. I love the last photo so much! I like what she chose too. Now to get that light replaced and get the whole kitchen photographed. Thank you Cheryl! We have snow here too – several inches. Sun the past 2 days though so the roads are mostly clear again. More snow on the way again I think. Nice job Jill… I bet your mother is thrilled!